January 18th is the birthday of A.A. Milne, best known for his beloved Winnie the Pooh stories. I just had to make some Pooh creations to pay homage to the creator of the adorable yellow bear. 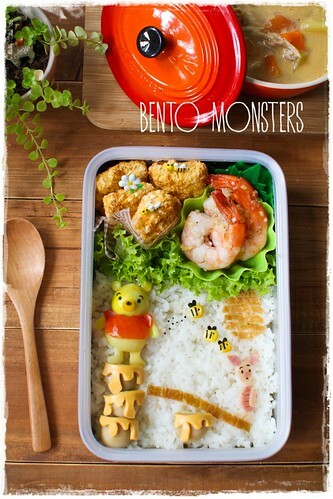 You can also check out my past Pooh bentos HERE. 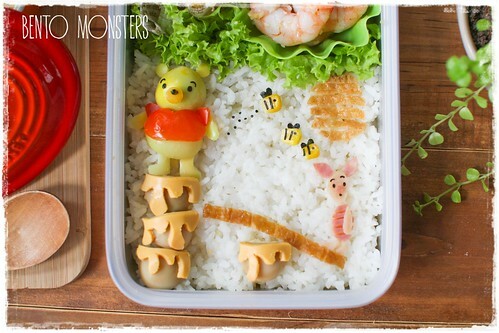 My bento friend, Mamabelly is hosting a Pooh bear linky party, please also head over to her site for more pooh-rrific ideas. Pooh just had the most brilliant idea to get his honey, except Piglet seems to think otherwise, lol. 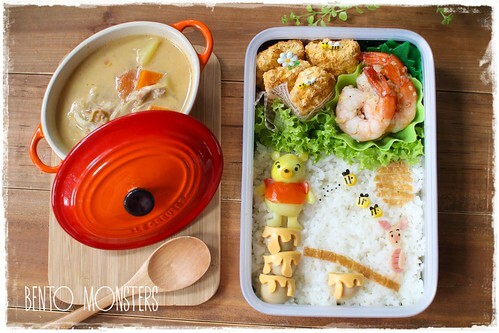 This dinner bento is served with fish fillets, garlic prawns and a bowl of chicken stew. Pooh and honey pots were made using quail eggs. Piglet was made from ham and bees were made from corn. 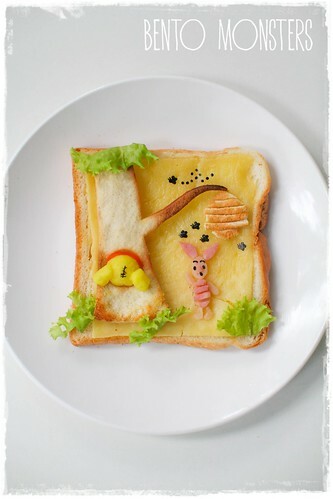 I also made another Pooh story on toast. Piglet is looking for Pooh, can you find him? My boys found this hilarious, lol. 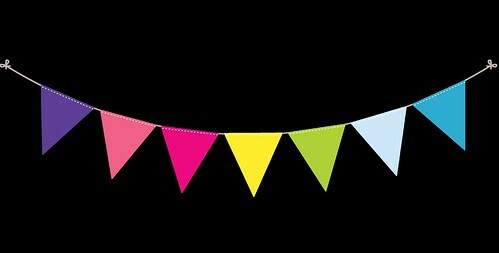 Thank you for linking up to my Winnie the Pooh link up! I love your lunches! So detailed and creative! 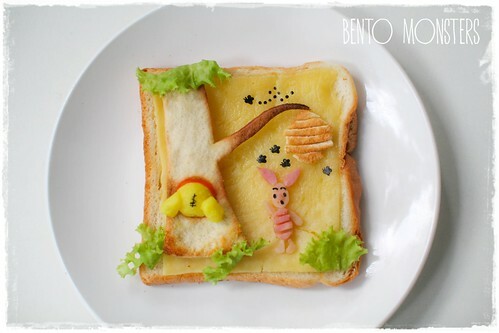 Especially the cute toast! Wow! The are definitely works of art. Beautiful! These are amazing! really really lovely details. I esp like the one where Pooh is in the tree! These are both adorable! So creative! Omg! So beautiful! Im really amazed by your detailed work especially the bee using the corn! Awesome as always Ming!!! Love all the details!! !